5 Rooms apartment for up to 4 people. 1 double bed and 2 twin beds. the toilet has a jacuzzi . It`s on a 4th floor. 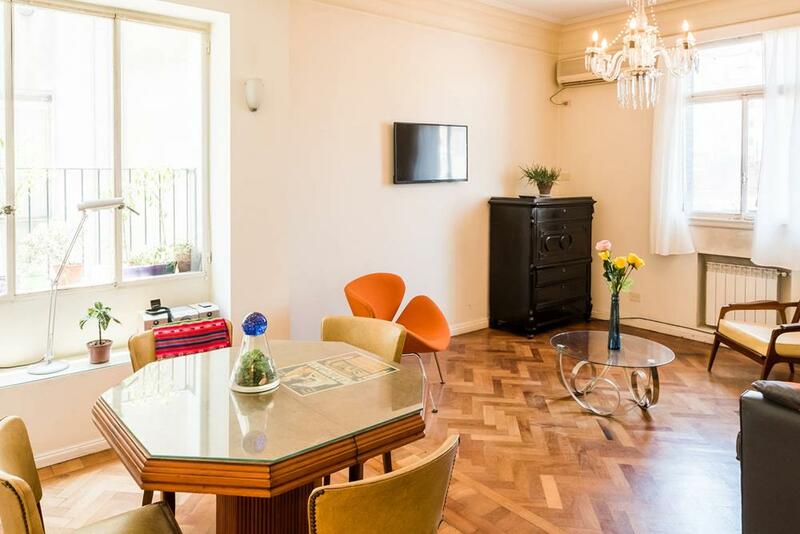 This apartment is within privileged boundaries of Recoleta neighbourhood. A few steps from the Cementery, widely visited cause of its niches and tombs where important families of the Argentinian history are buried. The area was initially just land, not many habitants but when the yellow fever attacked populations settled in the South of the city and what nowadays is called San Telmo, wealthy families started moving to their palaces in this area of REcoleta. In the area visit Patio Bullrich, which used to be a live cattle market, has been refurbished from scratch maintaining its original architecture. Its located on Libertador Avenue and Libertad street. You ll get access to many lines of public transport, to the Retiro Station, major train hub of the city and nearby as well is the Ferry Station where boats going to Colonia and Montevideo leaves from. Apart from this, the area offers a lot of walking tours by itself which offer beautiful places to see.